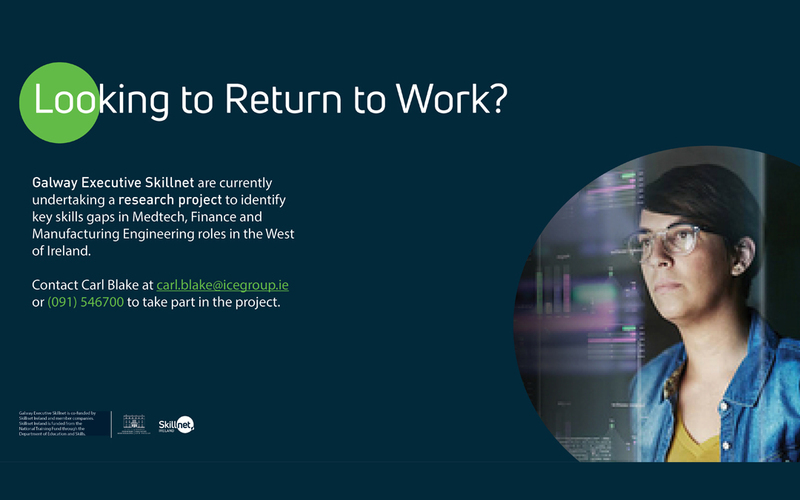 Galway Executive Skillnet are currently undertaking a research project to identify key skills gaps in Medtech, Finance and Manufacturing Engineering roles in the West of Ireland. One solution is to help people who have been on a career break to return back to work. If you, or anyone you may know, are currently on a career break (e.g. maternity leave, caring for a relative, recent early retirement etc.) but are interested in returning to employment please contact us today. Open to all on a career break who are seeking to get back to work, including those caring for a relative, maternity leave, early retirement, etc. Use this opportunity to inform National Goverment Policy and help regional development. ICE Group Offices, Centrepoint, Liosban, Tuam Road, Galway. RSVP to Carl Blake at carl.blake@icegroup.ie or (091) 546700.